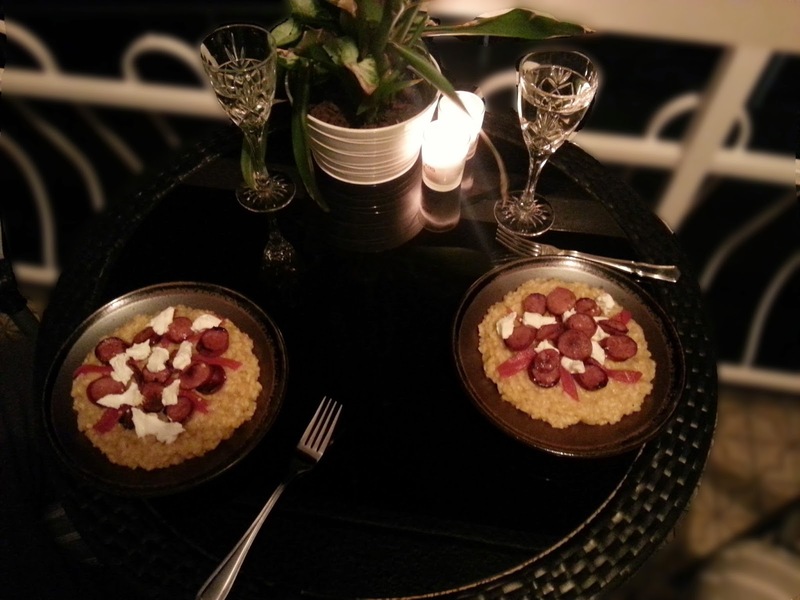 Our friend made us the most beautiful risotto we have had in ages a couple of weeks ago. He also happens to be a professional chef, so we felt pretty spoilt. He made it for us while we watched and chatted over a glass of wine. I kept asking him questions – how much of this are you putting in? How long for that? And he kept saying “there’s no set amount, just what feels right”. I took three big take aways from that chat and from watching him create. 1) Rather than add white wine as an ingredient to be soaked into the rice as I have historically done, use it to de-glaze the goodness in your pan before you add your stock. More details on this in my recipe below. Nom. 2) Make your stock from scratch. It is actually really cheap and easy to do if you take the time on the weekend and it tastes so much better when you do. Here is my recipe 3) Bring your stock to the boil before adding it to the aborrio rice – it absorbs better. My first experience of risotto was a beautiful simple pumpkin risotto at a dinner party I was late to (and got in trouble for) at my best friend’s place when I was a young frivolous 18 year old. I got distracted talking after work as 18 year olds do and arrived late and made everyone wait. Thankfully I have better manners now and am a bit more considerate of others. The meal was creamy and sweet. 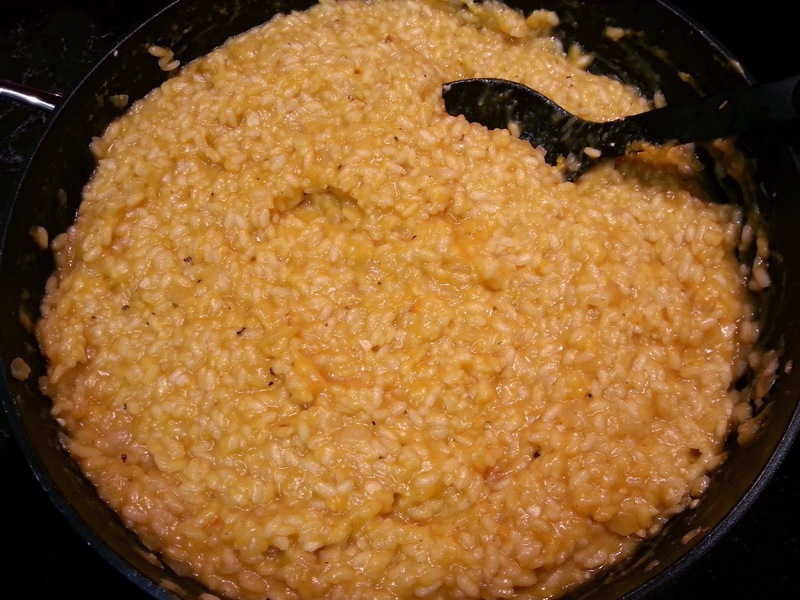 I wanted to make a beautiful pumpkin and sage risotto as a homage to both risottos. Pumpkin is sweet, so I wanted to complement that with some roasted capsicum, and cut through the sweetness with the tart flavour of goats cheese and the saltiness of chorizo. In a recipe I can’t exactly say “use the amount that feels right” of X Y or Z, so I will give a general gist but I invite you to play with your own measurements. Also – this is not diet food. It is divine comfort food. This seems to be a theme for me of late, I must post some more healthy options again soon. But for now, enjoy the deliciousness. 1.5L vegetable stock – I used my home made stock, see recipe here. This section could be an essay because risotto can be done any way. I like to have only a few flavours, and I like the combination of something sweet, something tart and something salty that the combination I choose provides. You could swap a pea puree (cook peas and onion, puree with a knob of butter, possibly even some mint) for the roasted pumpkin puree; swap speck, bacon, proscuitto or any other cured meat for the chorizo; and swap feta for the goats cheese. Other herbs which could work with my recipe include thyme and rosemary. You could always wilt some spinach through this at the very end to add some more nutrients and pretend that you are having a healthy meal if you like. Place the cubed pumpkin and roughly chopped onion into a bowl. Toss 1 tsp of sage and spray some olive oil through. Bake on a baking tray for 35 minutes or until nicely roasted. 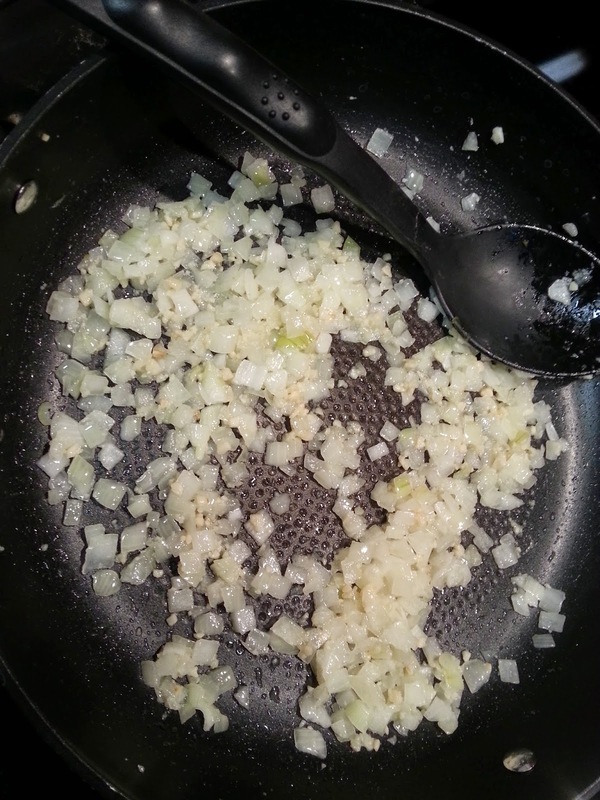 Meanwhile, pan fry your finely diced onion until translucent. Add garlic. 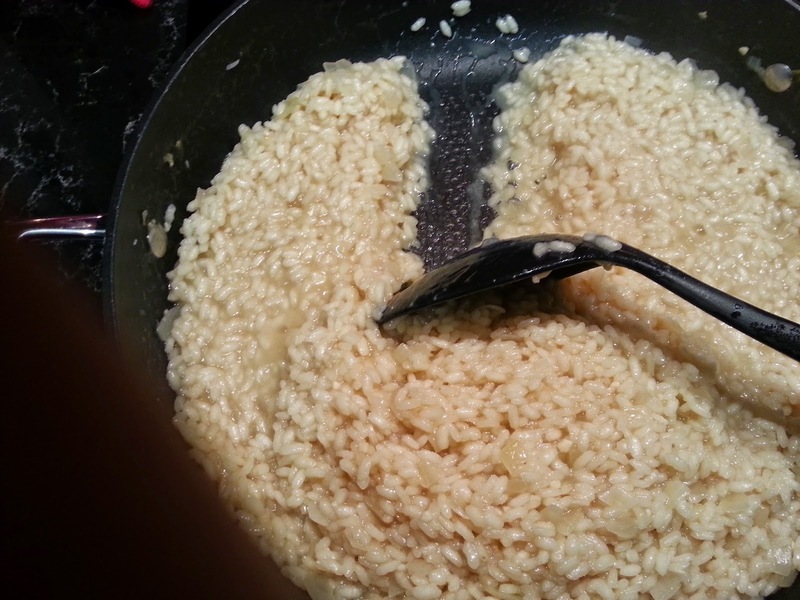 Add the arborio rice and stir for 1-2 minutes to ensure that the onion and garlic are evenly distributed and to coat the rice which will create a more tender risotto. Then add the white wine to de-glaze the pan. Make sure to really scrape up any bits that have cooked onto the pan and stir them thorough. This is flavour. Add the chicken stock one ladle at a time over a simmer. Stir occasionally and allow the first ladleful to absorb before adding the next. Your finished risotto will be al dente. You can taste it to see if it is the texture you like, smudge a piece on your cutting board to check whether or not it leaves a hard textured centre behind, and/or push your spoon through it – if it is cooked it will leave a gap (as below) but only for a second, before refilling itself. 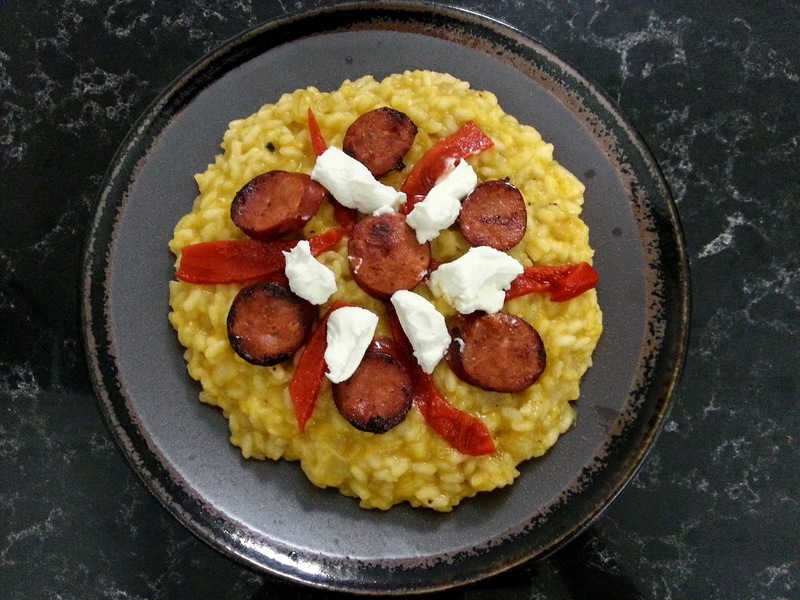 Between stirs of the risotto, pan fry your sliced chorizo. Once it is done, place it between two pieces of paper towel to soak up the excess oil. Once the pumpkin and onion has been roasted, blitz it with the 2nd tsp of sage using a hand held blender. 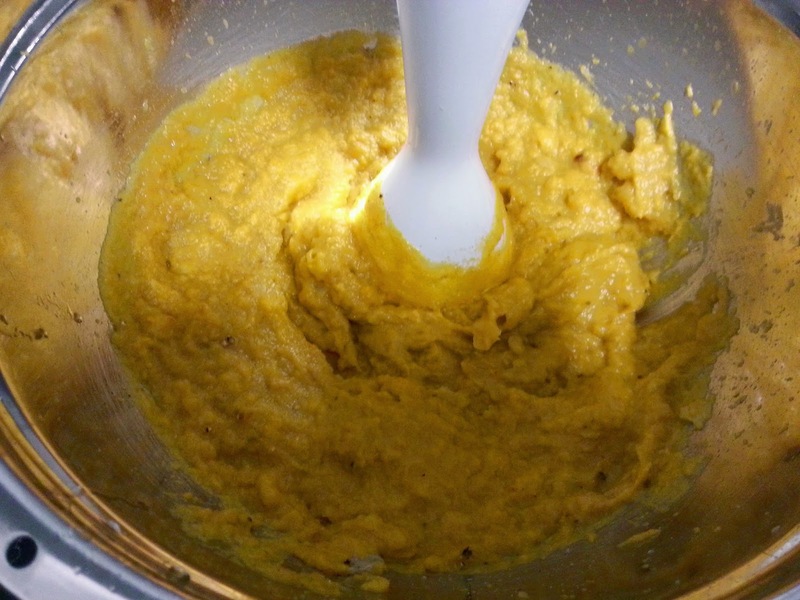 Stir the pumpkin puree, butter and parmesan cheese through the risotto, and season to taste. Top with roasted capsicum, chorizo and goats cheese. Yum creamy goodness. We enjoyed the mix of flavours and the creamy texture. This meal is very filling. You could easily serve a half portion with a side salad if you are in a healthy mood. We enjoyed it with the same white wine we used in the dish (sure fire way to match a wine with your meal) and candles on the balcony. The goats cheese really makes this meal.